On Dec. 7, Andrew Sheffield, director of brewing at Baxter Brewing Co. in Lewiston, told a group of Bates students how beer is made. As he spoke, the processes he described went on around them. The smells of fermenting barley and hops wafted through the brewery. Forklifts and other machinery roared in the background. A conveyor belt deposited cans of Stowaway IPA onto pallets. 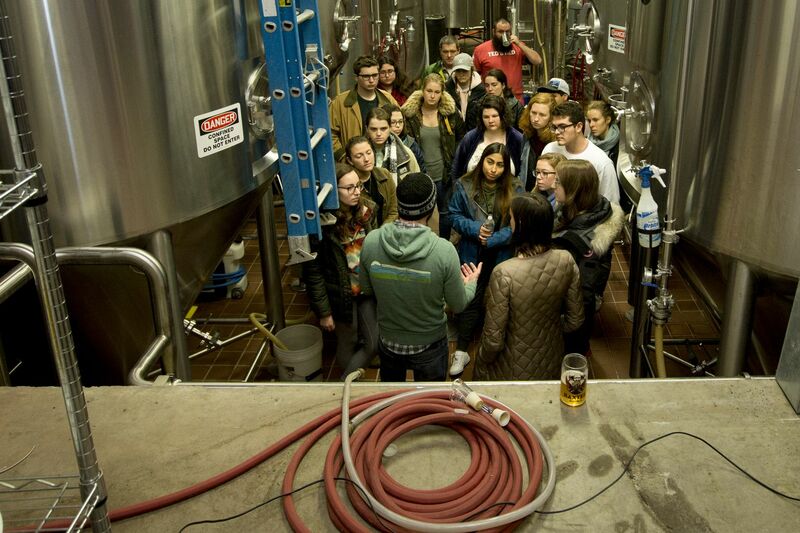 The students already knew a thing or two about how beer is made — the brewery tour capped “Plants and Human Affairs,” a 100-level lab course that, according to the course description, shows students how people throughout history have used plants to make “perfumes, spices, medicines, hallucinogens, fermentation products, oils, rubber, textiles, wood, sugar, cereals, legumes” — and intoxicants like beer. 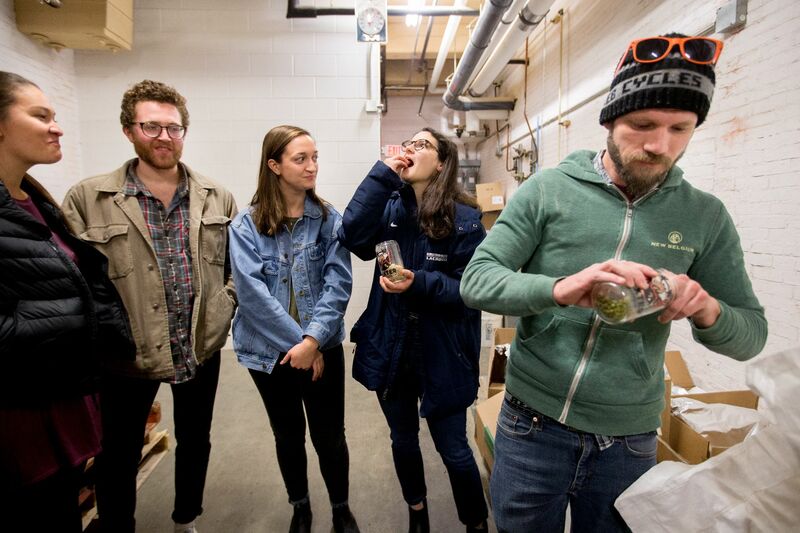 “We discussed the production of beverages that intoxicate, what plants are used to make those beverages, and the history behind it,” said Assistant Professor of Biology Brett Huggett, who taught the course. “We learned about hops and the cultivation and processing of barley,” one of the first crops domesticated in the Fertile Crescent of the Middle East. The class also discussed human uses of fungi, including yeast. At Baxter, they got to see those processes in action. The class took the tour in two groups, each starting in Baxter’s bar, where taproom manager Andrew Bielecki explained the history of the Bates Mill complex in which the brewery is located, the history of Baxter Brewing itself, and the craft beer market in Maine and New England. Sheffield then told the Bates groups about the science behind brewing — how barley is malted, mixed with hops, and fermented with yeast to create beers of innumerable flavors and colors. He passed around a cup of malted barley, which he encouraged the students to taste, and a cup of hops, which he recommended they not taste. Around the tour groups, Baxter employees worked, once forklifting a nearly floor-to-ceiling stack of palleted beer cans into the loading bay. Most of the students taking “Plants and Human Affairs” are not science majors — they took the course as a lab requirement. But the class, with its scientific, social, historical, and economic dimensions, offered something for everyone. Likewise, the brewery tour catered to a variety of interests. “One of my takeaways was the complex process brewers underwent to get their signature beer,” said politics major Alyssa Alexander ’18 of Lambertville, N.J. “I was really interested in how much thought they put in, from the chemical perspective of ingredients and technique, to the operations of how to get the freshest product to consumers.